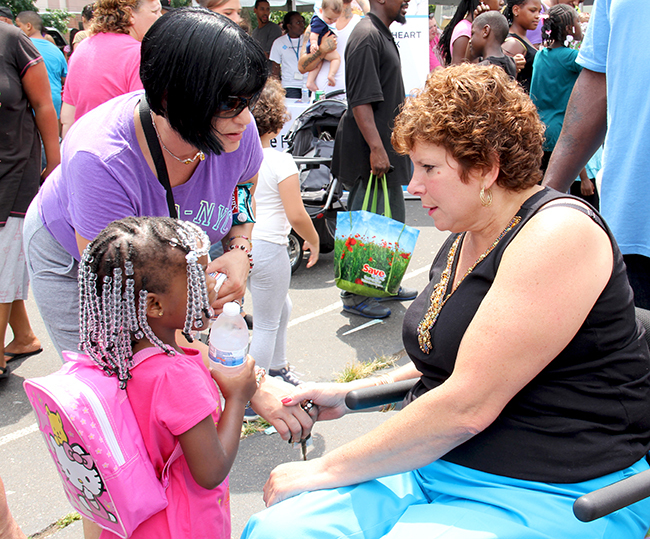 HARRISBURG, August 9, 2013 – Thousands of constituents from the neighborhoods surrounding Norris Square Park attended state Sen. Christine M. Tartaglione’s annual community festival yesterday. By coordinating numerous sponsors and community partners, Tartaglione was able to personally distribute more than 1,500 backpacks stuffed with back-to-school supplies such as pencils, notebooks and erasers. Sen. Christine M. Tartaglione (right) talks about the upcoming school year with constituents at her annual community festival on Thursday, Aug. 8, 2013. The event also featured free hot dogs, popcorn and water ice, along with family services such as fingerprinting and safety programs. Eight years ago, when the first community picnic was held in Norris Square Park, 500 children received backpacks that were donated by local organizations. Among the volunteers for the event were more than a dozen Philadelphia Police Explorer Cadets who stuffed hundreds of backpacks before the event and helped organize the crowds gathered to receive backpacks.